Our organic honey is something very special! Produced in Tuscany by a cooperative of young people who wanted to preserve the ancient flavours and traditions of the Tuscan countryside, it is made with purely organic agricultural methods ensuring an incredible flavour. This hamper includes three of our most popular organic honies along with a lovely hand-crafted drizzler! Organic Millefiori Honey (500g) The perfect honey for every use; dark, thick, crystalized with a rich sweet finish. It is a high energy food, perfect spread on buttered toast for breakfast and delicious with most cheeses. Organic Fruits of the Forest Honey (500g) Our fruits of the forest honey is deeply coloured and favoured honey, rich with the fragrances of Italian woods. This is a honey to savour in yoghurt, over ricotta cheese or on buttered toast. Organic Acacia Honey (500g) Acacia honey is very pale with a sweet, delicate floral flavour and therefore one of the most popular honey varieties. It is a good choice for mixing with drinks because it will sweeten them without changing the taste of the drink. Wooden Drizzler This cute little honey dipper/drizzler is the perfect tool to use with your jar of organic Tuscan honey! There's lots of surface area for your honey to cling to and it slides off easily or can be stirred into your drink/recipe/yoghurt if you wish! 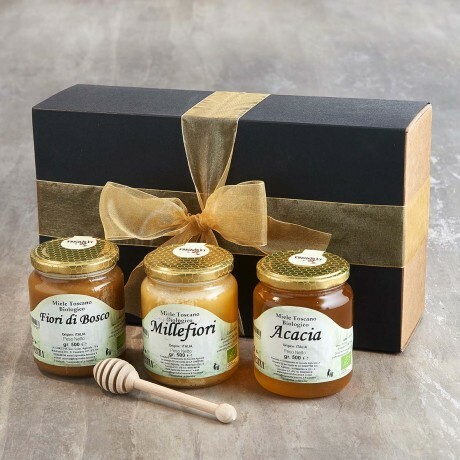 Your honey selection is carefully wrapped and presented in lovely gift box tied with a ribbon. A gift message option is available at the checkout. Please note that if we are out of stock of any item we reserve the right to substitute it with the most similar available item.